Mexico's Popocatépetl volcano sent plumes of ash into the sky on Monday night after a strong explosion that sent burning rocks flying, said Mexico's National Centre for Disaster Prevention (Cenapred). Located in the outskirts of Mexico City, Popocatépetl's explosion took place at 9:30 pm local time. There were no serious injuries caused by the explosion. 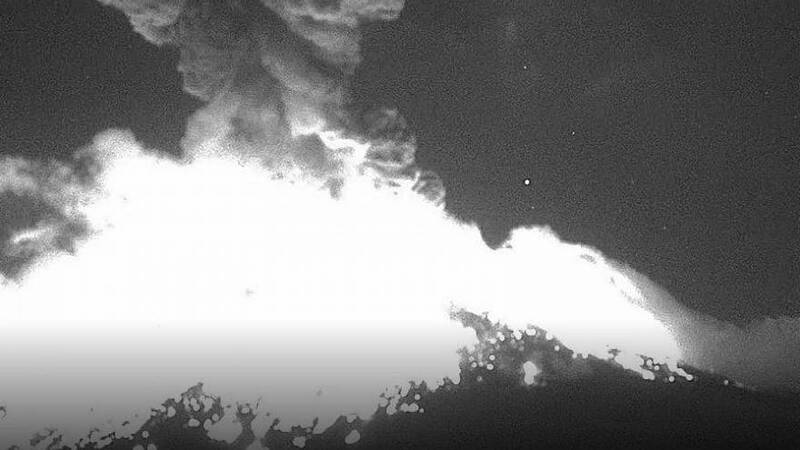 A video released by Cenapred showed how the volcano's crater lighted it up as the volcano spewed huge amounts of ashes into the sky. The volcano also threw fragments of burning rock during a series of exhalations recorded after the explosion. Popocatépetl — which means "smoking mountain" in Nahuatl, the language of the Aztecs — has renewed its activity in the past weeks, prompting authorities to issue warning messages to keep a safe distance. Right before the explosion, a video of people climbing all the way to the volcano's crater circulated on social media despite the Cenapred's recommendations to stay at least 12 kilometres away from Popocatépetl. After seeing the video, the Cenapred issued its own video explaining why it was dangerous to get too close to the volcano's crater. The natural disaster agency has set a yellow phase two warning level over the Popocatépetl's activity, which warns against low to intermediate activity as well as light to moderate ash rains in nearby populations. The Popocatépetl is Mexico's second highest mountain and sits 5,452 metres above the sea.